This has been a wonderful week. I’ve learned so much from sitting in our sukkah, and from waving the lulav every day with my family, and from the times we’ve been joined by our friends and community. I’ve been blessed again this year to watch Ushpizin and learn something new about my walk of faith and Adonai who walks with me. So what was the biggest lesson for me this Sukkot? In Messiah we find our rest. Sukkot is the festival about God dwelling with man. Whether he was conceived or born on Sukkot, he came! He looked at mankind and how badly we’d mucked it up, and He knew we weren’t getting all we should from the systems in place–He’d already said, through Moses, that One would come, like Moses, who would be able to explain everything that Moses didn’t get. He came to dwell among us as one of us–modeling, teaching, showing us what it means to be in complete relationship, in complete echad, with God. THAT is the message of grace! Salvation should really have nothing to do with whether or not there is a literal hell. If you are in relationship with God, it’s not for you and not something you need worry about. Just like marriage isn’t just about not being single. Salvation should not be about trying to be a good person. It is about becoming a righteous person–allowing God to renew your mind daily and make you over into a new person. As marriage is about becoming a good wife/husband. This is why, from beginning to end, we find wedding language. And this is why Sukkot is the festival of weddings–when brides and grooms enter the sukkah and spend their week dwelling together, naked and unashamed. The lover of our souls has a future planned for us, and in his father’s mansion there are many sukkahs–if it were not so, he would have told us (John 14:2). And while it’s amazing that we will get to be with him forever, it’s more amazing to me that we get to dwell with him now! Dwelling with him now means the journey isn’t just to a holy destination. The journey itself is holy! And we are invited into the sukkah daily, to begin the next leg of our holy journey each day. We are in fellowship with our God. We are accepted and sanctified before we are perfected–yet we are being perfected. That level of love and acceptance and that promise of perfection . . . these are gifts of love. Unmerited, yes, but given to us nonetheless. A reminder of that each day is a good thing. Learning to remember each day is even better. Oh, and I’ve learned I really love my wooden windchimes. Every life needs a soundtrack, right? Last night our sukkah (and our home) was filled with our wonderful and growing community. Lulav was waved, wonderful food was shared, fellowship was everywhere, and Ushpizin was enjoyed. If you have not seen Ushpizin, I highly recommend it (I believe Netflix still has it). It is a movie from Irael and is about a Hassidic couple, Moshe and Mali, who have nothing but each other–no money, no child, and no sukkah for the festival. When Moshe is in the group of men from the yeshiva who is given no money for the week, he shares a friend’s thought with his wife . . . . If you have not, it is because you did not ask God, or you did not ask enough. As he heads to take a nap, his wife redirects him to prayer. She is reading and praying through the Psalms, he is pouring out his broken and contrite heart to the Lord, and at the height of both, let’s just say there is a Sukkot miracle. The story is lovely. The people are wonderful (even my children were saying last night, “I could see you doing what she’s doing,” and, “I could see you wearing that.” ) And as one friend pointed out, she loves the movie because every time she watches it, she learns something new. I absolutely agree! There are lessons about prayer, faith, friends, what it really means to face a test from the Lord, the need for a man to focus on keeping his wife happy (a really big theme through a lot of Rabbinic writing that, as a woman, I find so validating and beautiful). And what struck me last night is the reality that we are who we are, and we are where we are, and the only way to advance on the journey is to face what is before us with obedience to the Lord. So often, in Western thought, we seem to set these lofty goals and then try to find short cuts there. Very early in my marriage, for instance, God told me it was time to rest. I started out by cutting half of the 14 active ministries from my schedule. I worked on taking naps. I did lots of practical (and, yes, part of the journey) things, but God kept telling me to rest. I finally admitted I didn’t know what that means, or how to do it. And humility started me on the actual path (not just clearing things up back at home so I could start down it ). Since then God has been teaching me about Sabbath, and about what is cultural regarding rest versus what He means by it. He has allowed my body to be driven to the point that I have learned major lessons, blessed is He. And He has brought me movies like Ushpizin so that, when I was ready, I was able to see other lessons without learning them the hard way. I have moved from the idea of New Year’s Resolutions, or vowing to do X perfectly because now I know, and I have realized that each day must begin with resolution and the humility to accept that I will never do X, or Y, perfectly because I will never fully understand either. Doing is the response to the test, and we can only do what we already know. So each day I now strive to live consistently with my convictions in the face of whatever I encounter. I seek to be consistently me–who I am and where I am–and to obediently respond to what God allows, or brings, before me. That is my little part of the bigger picture. And for the first time, I feel like I am resting–much of the time, anyway. I put less things on my schedule, I am more realistic about the constructs of time, I stop and refuse to feel guilty when I am sick or recovering . . . I allow life to take the time it needs, and I move within it. I no longer try to be master over it. I leave that to God . . . and when I’m not trying to carry His responsibilities, my life is much less burdened. So today, this Shabbat, rest where you are. If the choice to work is presented to you (and you’ll know, because you’ll be aware of it) make the right choice. If you start to feel stressed about time, remember that you are not Lord over it. And if you think of all of the things that are going undone, or the things in the rest of your life that remain unresolved, remind yourself that there is tomorrow to examine them, and today has another purpose. Rest is, in one sense, fasting from the stresses of life. When we make it another stress, we miss the point. HaSameach and Shabbat Shalom. May you be richly blessed today. So what about the sukkah? Why are we supposed to dwell in temporary structures for a week out of the year? As with most things the Lord commands, at least one aspect of it all is to remember. We remember dwelling as a nation in the wilderness for 40 years. We remember that our bodies are but jars of clay (2 Cor 4:7) and therefore temporary dwellings for us while we are in this world–and in the World to Come we will have resurrected and perfected bodies! Could there be more to it? Of course there is the aspect of obedience–Adonai commands it. To do less than he instructs is to miss the mark. We miss the mark all the time–sometimes out of ignorance, sometimes out of immaturity, sometimes because we choose our own path . . . . but when we learn of one of God’s commands we must have some response to it. And when that response is obedience, it can only be to our benefit. God’s instructions are, after all, for us. Prophetically, it is a picture of God dwelling with man–the Millenial Kingdom. The general Messianic thought on the Festival of Sukkot is that it is when Yeshua was born. The story certainly presents a picture of Sukkot–especially when you learn that what is generally translated “manger” is the Greek word for “structure.” And I think this is a beautiful understanding. The thought that Messiah came into the world at this Festival infuses it with an amazing meaning that I believe holds great value. In studying it out, I think there is (possibly greater) support for his birth being at Shavuot . . . the day the 10 Commandments were given, and the day the Holy Spirit empowered first the Nation of Israel and then the Church as Israel expanded and went out to the nations! This addresses a few of the problems I have had with the idea of a Sukkot birth. As I just mentioned, it doesn’t fit with the giving of the Torah or the Holy Spirit, and God is pretty consistent! If a day is for something, it’s for something. It also doesn’t fit with the distinctions between the Spring and Fall festivals. The Spring Festivals were fulfilled at his first coming, the Fall Festivals will be fulfilled with his second coming/return. Isn’t that what we always say? Then why have we attached his birth to a Fall Festival? But what does that do to the idea of Yeshua and a sukkah? A Shavuot birth would require a Sukkot conception. That means that the Sukkah would have been his mother’s womb–his mother’s jar of clay, in which she temporarily dwelled. This brings, at least to me, a beautiful humanity to the first Sukkot for which Yeshua had joined us. As a mother, I consider the year of “dwelling with God” that Mary would have been blessed to experience as she grew the body of Messiah in her sukkah. A year of holding this treasure inside of her physical body before, on Shavuot, he would have been brought forth to be shared with the world! To be fair, there are Messianic Rabbis who take both positions, but this isn’t a theological discourse or a thesis paper. It’s ponderings. And regardless of which Feast or Festival Messiah was actually conceived or born, he came–and that is the most important part of that! We do know he taught some amazing things at Sukkot . . . When we believe in him, out of us flow rivers of living water. From our innermost being will flow out the Holy Spirit. So with a Temple no longer standing, those who believe in Messiah have become the Temple of the Holy Spirit. And out of us flow not just living water . . . RIVERS of living water! The Spirit has been given, and we who believe have received, and out of us flows living water to the nations . . . that really is Good News! So it’s okay that I’m not technically in the sukkah this morning. Because I dwell in the sukkah of my body–and my body is the Temple of the Holy Spirit. So I thank the Lord today for that body, for the Holy Spirit, and for another day of Sukkot on which I may learn something more about Him and His purposes for me. The ultimate example of what it means to live the life of a citron came to dwell among us, and we bruised him. There has always been a thought of intentional harm when I have read that verse, or heard it taught. Men wounded Messiah; our sins bruised him. And I think that is accurate. But I think we often overlook the lack of intention present in the vast majority of sin that bruised him. Bruising comes from the accidents–the trips, the falls, the misses that weren’t planned. This is challenging how I look at what Messiah endured–and what it means to be called to follow in his footsteps. And I realized, the reason that the citron was dropped was because it was not bound together with the rest of the lulav. It was separate. Sure, we hold them together, and we do need to be reminded that we are all part of the same community. But to be the citron really means to be set apart and called to live in that community in a very different way. We are bound together with our community because Adonai has placed us with the lulav. How we walk as the citron will be viewed by others as a witness–as a testimony to who we really are and what we really believe. But we are not to strive to be so deeply connected to the community, to men, that we lose site of the reality that the citron is not tied to the holder–it is set apart. Since we are called to walk in the footsteps of the greatest citron who ever lived, I have to imagine that our lives will involve some bruising. To be the citron means that when that happens, we don’t need to ask where God is in our suffering; we don’t need to worry about our appearance or what others think; like the citron in our lulav this week . . . . we just need to keep being the citron and putting out that heavenly aroma that draws others to us so that we can share the fruit of what we have learned. We will get dropped because we aren’t in the holder. We will be bruised because that is what happens to a citron that is in this world. Maybe the most beautiful citron is the one that has been bruised and kept its scent . . . that is the citron that knows who it is. That is the citron that can point us to the One who was bruised by our iniquity. That is the citron that can show us how to live in this world without being of it. So when my family wakes in a bit and we wave the lulav together, I’m going to look at the bruising in a whole new way. And I hope that, after I wave the lulav this morning, I will be able to look at some things in my life in a whole new way as well. The idea that God tests us never settled right with me. It was always presented with a very Greco-Roman flavor that tasted bitter in my mouth. As we read through the Percy Jackson series as a family I realize that is because a “test” to the Greek gods meant you were presented with unsurmountable odds and we get to see what you’re made of. Will you survive? If so, how? Will you die? What will be your fatal flaw that leads to your demise? There’s so much for us to learn. It is the epitome of a life pre-test. And the hope of the answers is random at best–we just can’t know for certain what the prophecy means, so we’ll see what happens. Then, several years ago, we watched Ushpizin. Amazing movie, if you haven’t seen it. And the Rabbi and his wife keep talking about this being a test, and that being a test, and I started understanding some of the arguments over the years about, “The Jewish God is just an angry God and everything is a test.” Except . . . . that isn’t the God I know. And . . . . that isn’t the way they were saying it. Rather, there was an excitement for the test–praying for God to let it continue! There was hope, and conviction. And I had to understand more. As I studied, I came to learn that the Hebraic understanding of a test is not a pre-test, like the Greek mythology tests. Rather, it is a post-test. God teaches you all sorts of things in your life–some through those who have been brought to mentor you (parents, parents in the Lord), some through those who have walked alongside you (friends, family), some through those who have been the bane of your existence. When you don’t know the lesson, nothing about it is expected of you. But after you learn the lesson, then you come to an awareness of the opportunity to make that right choice, or do that right thing, or say that kind and loving word instead of the hurtful one. When you become aware of it . . . . THEN it is a test! Yesterday I was presented with a situation that initially had me banging my head and staring at the computer with utter amazement at the bizarre thing going on. My initial, fleshly reaction, was truly like the willow (no fruit or fragrance). Then I heard God prompt me with the question, “Are you being the citron?” and since I had only recently left the sukkah where I had been preparing part 2 of this series I stopped and realized that no, in fact, I was not. So I was prompted with fragrance, but the edits showed no fruit. So I had progressed to the myrtle. Okay, fruit, fruit . . . and I tried again. But that was through my own effort and, honestly, it showed. It was at that moment I realized, IT’S A TEST! A REAL SUKKOT TEST OF MY VERY OWN! That awareness is what allowed me to be the citron. That understanding of why this thing was happening–now, out of the blue–is what allowed me to even be able to set aside my flesh and desire the fruit and fragrance of Messiah speaking through me. I was moved with compassion, not my own frustration over dealing with this issue again. I was moved with love, not annoyance. Because of what the situation is, I suspect it will pop up again. But this time, regardless of what the other person read into my words or my effort, I know that I responded in a way that was submitted to the Lord. And if/when it does come up again, I hope and pray I will see it as a continuation of the test that is presented me with full hope that I can see victory because I have been prepared with access to the full armor of God “Therefore, take up the full armor of God, so that you will be able to resist in the evil day, and having done everything, to stand firm” (Ephesians 6:13). For the armor girds my loins with Truth, protects my heart with Righteousness, covers my feet with the Protection of the Gospel of Peace, and protects my mind with Salvation. As I face the test, I carry the Shield of Faith, “with which you will be able to extinguish all the flaming arrows of the evil one,” (Ephesians 6:16) and the sword of the Spirit, which is the Word of God (Ephesians 6:17). There’s nothing hopeless about that at all! So put on your armor, and be on the lookout for your own Sukkot test. Trust that if you are facing the test, you have prepared for the battle, and share your victories with those you walk with . . . I believe it will encourage us all. This morning I woke and came straight out. I live in the middle of the desert so it’s impossible to explain exactly how hot it can get here during the day, but they take the official temperature you see on the news in the shade at the airport. I have come out to my van at the end of a day at a water park during the summer and had the van’s thermometer tell me it was over 150 degrees out. Some nights it’s almost 100 degrees at 1am. And I know it’s supposed to be autumn, but we still have another month before that really impacts us in any practical way. Yet at this moment, in the sukkah, it is breezy and gorgeous. It’s like sitting in Adonai’s lap. So here I sit. And this morning I am thinking about the lulav and the privilege of bringing a wave offering before the Lord. And we might be able to engage in lots of heady debate about what constitutes the willow, or the myrtle, or the palm or the citron. Lots could be argued about whether fragrance and fruit could coexist without representing an inherent connection. We might split into positions or divide for obvious doctrinal differences. EXCEPT . . . . as you complete the wave in each direction, you pull the lulav to your heart. YOUR heart. Your OWN heart. My prayer today is to be the citron. That must start with making sure that I am connected to the True Vine. It must continue with remembering I am a branch–I cannot force fruit to grow. It is the fruit of the Spirit. This means my connection to the Vine must be solid so that the Vine’s Spirit can flow through me and to the world. And the amazing thing is that this is not about removing myself from the process. Rather, it is about recognizing my rightful place in the process. I will only have fragrance if I am connected. I will only have fruit if I am a conduit. So off I go to the house–yes, in the time it took to write this the sun has come up above the fence line and it’s already getting warm. But I go in changed in a way that seems to happen each time I sit and think in the sukkah. **Expect some new articles soon on the Hebrew months and what we are supposed to learn from them. It’s amazing what the Lord has been teaching me about this over the last year! I’m so excited to share it. I am up before the rest of the family (except for my dear husband who is in the front yard doing something) am I am reflecting on the amazing awesomeness of Adonai! 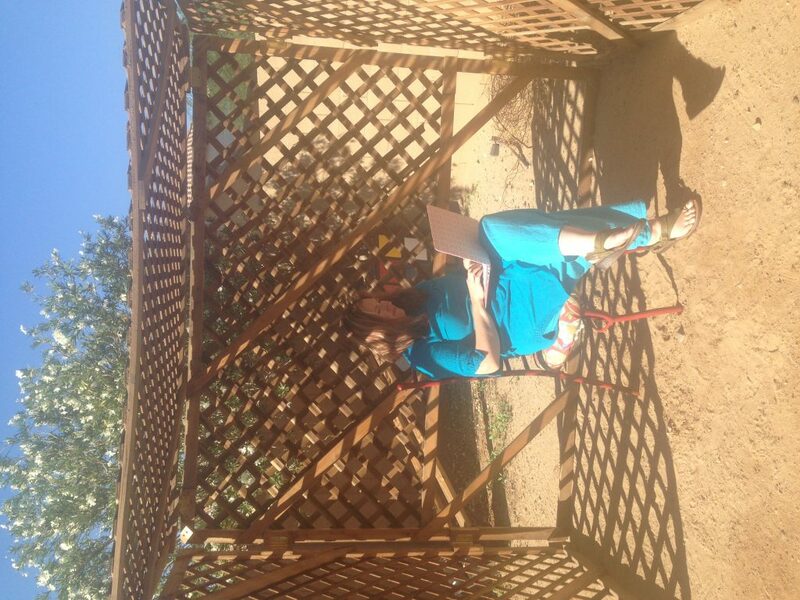 I came out to reflect in our sukkah and share about last evening’s celebration. The Feasts and Festivals humble me. They are times when I realize how much I will never know this side of eternity–and yet how much I have learned. We discussed how deeply the Lord knows his creation and how he knows that it is by doing and repeating things in a kinesthetic way that we learn what we are supposed to be learning–and how many lessons are wrapped into the doing. Our yard was filled with so many wonderful people last night as we stood in the Sukkah and waved the lulav–many for the first time in their lives! Those who had waved last year for the first time commented on how they got even more out of it this year because they weren’t thinking as hard about what direction they were to turn But we talked about coming to an understanding that these things are commanded for us–and what it means to come later in life, versus what we will be able to provide for our children. Our congregation had a pre-Sukkot get away. Eventually we will camp for the actual week of Sukkot, but this year we made a step towards that and got out of the city to focus our hearts. Not everyone’s lives and schedules have gotten to the place of going away for a week. I understand! This year was the first time out intention to get away at all at this season had finally been realized! We slept in a yurt and the first morning when we awoke I realized that directly above me, through the see-through top of the yurt, was the top of a brilliant pine tree. It was so huge above us, and with so many branches. One of my 7 year olds lay next to me on the blow up mattress as we watched the tree in the early morning hours. I pointed to it and explained that Adonai says his nation is a tree–and that we grow from our parents at the level of righteousness where they are. We talked about all of the things his dad and I are able to teach him, and how our hope and prayer is that so many of these things will be easier for him. I told him that Hashem’s design, and my desire, is that our children will all grow in greater righteousness than we are able! And we adults discussed this last night. When one has not been raised celebrating the Feasts and Festivals . . . . when one comes to this later in life and learns that for our whole life before we were missing this very big “teachable moment” (spoken as the homeschooler mom I am ) . . . one of the things we grieve is that we did not learn as much as we could have over our lives. We are humbled to be like little children–and perhaps this is part of what Yeshua was speaking of when he said, “Truly, I say to you, whoever does not receive the kingdom of G-d like a child shall not enter it.” Each year as we learn and do more we are receiving the Kingdom of G-d like a child! And when we learn these things while our children are still young, we are allowing them the opportunity for even greater righteousness than we have access to! The Lord instructs us to do and say certain things, “When your children ask you why you do . . . . tell them . . . . ” And our children have the opportunity to ask us! When everyone awakes today I will bring them out to start our homeschooling day in the sukkah. We will wave the lulav and we will talk about Sukkot. My children will have the opportunity to ask me. And I am reminded again that it doesn’t matter so much when I came to the awareness of the need to do this thing. It is not so important when we started. The important thing is that we came to understand, and we are doing, and when my children will ask me, I will be able to tell them. If the rules are posted, are consequences punitive? That’s such a tricky one–because the current method of thinking would be if the child knows in advance what is expected then breaking the rule is a choice and it’s not punitive to impose a consequence. But the simple wording of ‘impose’ shows that this really is punitive. Punishments are things added on to a situation to drive home the lesson inherent in the situation. They serve as a distraction from the real lesson unless they fit Jane Nelson’s definition of Solutions in that they be relevant, related, respectful and helpful in preventing the situation in the future. Solutions are not intended to cause you to feel bad or suffer in anyway, though they aren’t necessarily pleasant or fun. Positive doesn’t mean fun all the time or happy, it means non-punitive. This is an article where I talk more about consequences–the difference between natural and logical. Basically I believe that a parent’s responsibility is to determine, to the best of their ability, the natural consequence of an action and then prevent it until the child is ready to survive and learn from it. Logical consequences, or Solutions, are for older children who are developing adult logic and reason (so from age 8 on when there is pre-logic being developed). Consequences need to be approached as a teaching aid, not a behavior prevention and not something to cause children to feel bad for what they did. Guilt is a great motivator for change, but imposed guilt is shame and shame tends to paralyze and block learning. If posting the rules is for the purpose of being able to use a consequence and feel justified then I would encourage a parent to not post the rules! But if posting the rules is seen as a tool for helping everyone remember them, and seeing them will help the child remember, then narrow down and post away!